I have no idea how we managed to get such good seats! I almost never watch fighting game tournaments, even online. Even those considered “easy to pick up, hard to master,” such as Super Smash Bros. were seemingly too obtuse for me to wrap my head around, and thus I had trouble understanding what was so damn impressive about all the professional eSports players. 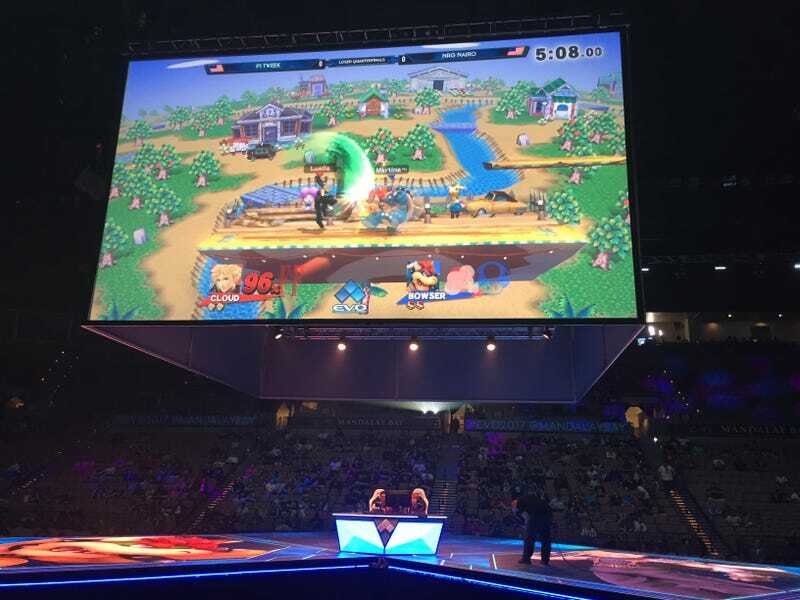 After physically being at EVO to witness the electrified fans, the intensity of the competitors, and the jaw-dropping skill displayed during each match, I’m now beginning to understand why EVO is as “hype” as it is. Our family trip to Las Vegas had been planned well before I had any knowledge of EVO, and my parents certainly had no knowledge of it either. A few days ago, however, I saw somewhere that the last day of EVO was going to be held at Las Vegas while I was there. I let my parents know about this, and they agreed to take me there. I wasn’t overly excited to see it, but I figured that it would be a wasted opportunity to not go to EVO when I was going to be in Las Vegas anyway. After the always-wonderful experience of waking up early for a flight, going through all the TSA, the long flight itself, renting a car, checking into a hotel, etc., I found myself walking into the EVO 2017 stadium to near-deafening noise from all in attendance.At any rate, the actual Tekken 7 matches began right around when I walked in. At first I was engrossed by the flying punches and kicks on the screen, but I eventually lost interest halfway through. The entire “top eight” took around two hours, and for someone who had literally never seen a single match of Tekken 7 played by anyone before EVO, it was hard to understand exactly what was going on. But as I kept on watching, I started to become more invested again. The commentators provided some context by explaining both the players and the game itself, which provided me with just enough information to know when something really impressive happened. The crowd was also so hyper all the time that it was really infectious. I couldn’t help but get hype myself, even if I didn’t entirely understand why! And, of course, the closer we got to the grand finals, the more excited everyone became. Then came Super Smash Bros. If I was invested in Tekken 7, I was absorbed by this game. Whereas Tekken 7 and Street Fighter V (the other two games I saw at the tournament) were working toward the goal of bringing a health bar from 100 to zero, the act of throwing a character off a stage is much more intuitive. There are the percentages that signal how easy it is for a character to be thrown off, but that only makes it more exciting when someone gets thrown off with a relatively low percentage or survives with a really high one. It also probably helped that I know a little bit more about Smash than I do about Tekken or Street Fighter, and that I already love a lot of the different characters from all of the games that they originated from. After the absolute feverish hype that came with Super Smash Bros., I found it hard to get as excited for Street Fighter V. I’d been sitting in the same chair for more hours than I’d been on my flight earlier that day, my eyes were showing strain from staring at the bright screen for so long (and damn, SFV is a bright game!) it was getting late, and it was back to the “get the other player’s health to zero” fighting, like Tekken 7. Even the fired-up crowd wasn’t enough for me to take any more than a casual interest in the game. We decided to leave a little early to beat the crowd and to get dinner, but I was surprised to see just how many televisions were airing EVO Street Fighter V everywhere I looked. I knew next to nothing about the games being played and the people playing them, but EVO 2017 was nevertheless an unforgettable experience. I was more excited during this event than I’ve ever been during any sporting event, and this event cements in my mind that eSports are certainly worthy of being called sports, even if they are for a slightly niche audience compared to football and soccer. This was also my first gaming convention ever, and I can’t wait for my next opportunity to go to one again!